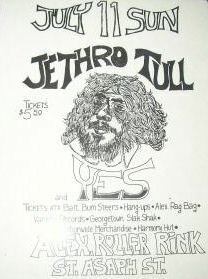 So my parents dropped us off at our weekly Alexandria Roller Rink in Maryland to find that a band called Jethro Tull & YES had booked the place. I still remember my friend saying.."So who the hell is Jethro Tull? LOL. We knew the doorman who let us in but had only minor knowledge of either band at 15 on July 11, 1971 which turned out to be the day my music life changed forever...inside the small auditorium type setting with folding chairs the opening act, YES, blew my mind. Bill and Chris held a lot my attention while Steve & Jon were like magic or like nothing I had ever seen during my yoing 15 years. Then Tull came & were amazing. Ian was like Hendrix on flute. So blessed to have that chance freaky unintended life changing experience that made me into a ProgRock disciple.